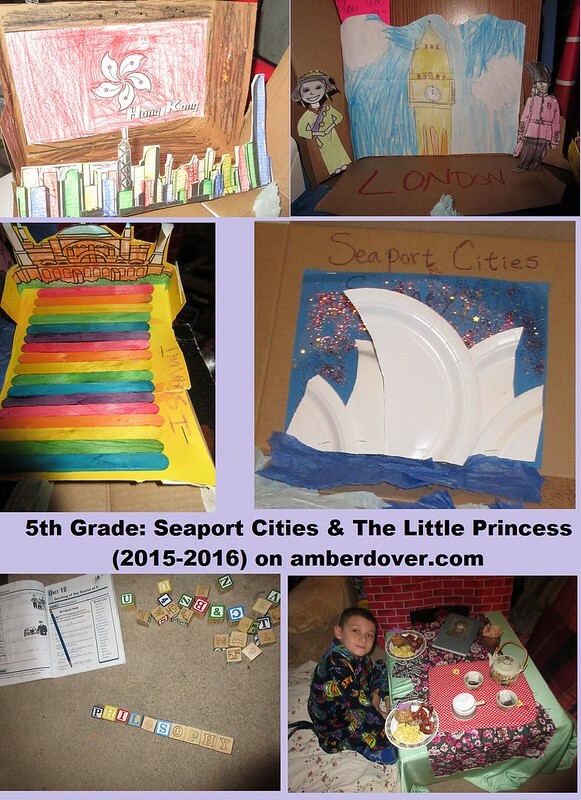 In this post: A seaport cities diorama, spelling ideas, Degas’ Dancer, and a breakfast party for the book, A Little Princess. Hello, dear ones! I’m back with my second 5th-grade post. I hope to start posting 6th grade next week. We will see. For now, I’ve got several neat ideas to share. Sydney~ We cut paper plates to look like the Sydney Opera house. Michael made fireworks on blue construction paper with glitter. We used blue tissue paper and sea creature stickers for the ocean in the middle of the box. Hong Kong~ Michael colored the flag and glued it to a shoebox. Then he cut out the skyline of Hong Kong, to put in the front. While learning about Hong Kong, Michael colored a Chinese junk ship. We put it in the ocean section. Michael used pool noodles, tooth pics, and paper to make little sailboats. Then Michael colored and put together Chinese puppets. Michael used the puppets to do a show for Sukkot. Istanbul ~ Michael colored, cut, and pasted the Hagia Sophia. We glued multicolored sticks to form the steps of Beyoglu. London~ Michael drew Big Ben and pasted it on the box. Then he colored the Queen and a guard. He cut them out and stood them on the sides. We found the cities on a map and labeled them with stickers. After learning about the elements of art, we began learning about different art movements. First, we learned about impressionism. Impressionist paint with bright colors and make images that are somewhat blurry, like a quick glimpse. There’s not a lot of detail. Impressionism & Ballet ~ We also learned about ballet and opera. We read about Swan Lake and Michael drew a swan. Degas’ Dancer ~Edgar Degas was an impressionist. Michael painted a ballerina inspired by Degas’ work. Michael’s journal for 5th grade was a mixture of subjects. Michael looked up the definitions for opera and ballet. He made a little stage with ballerinas and pasted it. For English, Michael wrote a story about an old house, using personification. Yarn Octopus ~ We made an octopus for our craft. I tried to think out of the box for our spelling words. We tried different fun methods. We used paper math symbols from the Dollar Tree to do math on the trampoline. Our rainbow parachute kept us in the shade. A Little Princess ~ Michael read A Little Princess and we used Litwits for complementary projects. Michael put together a diorama of Sarah’s attic view. You can see London’s Big Ben behind the curtain. We also have her doll Emily and where she slept. There’s a fire in the corner. I love how this study went right along with our seaport study. We had a special movie breakfast party. I tried to recreate the scene where Sarah wakes up to a luxurious breakfast in the attic. The rajah snuck food and finery in her window while she and Becky slept. This was when Ms. Minchin punished them without food all day. I stapled brick paper onto a project board. I put black paper and red and orange tissue paper for the fireplace. I mix matched scrap fabric to decorate the table. I found an Indian elephant figurine since Sarah first lived in India and was friends with the rajah neighbor in London. I brought out my Japanese tea set to make the breakfast fancy. I hung the fabric around the TV. I put out different items from the book: a porcelain doll, a mirror, gloves, and a locket. I set out our robes and slippers since Sarah and Becky were given fancy robes. I made pumpkin cupcakes with caramel apple frosting. I found an elephant decorating kit at the Dollar tree. We also had bacon and eggs while watching the movie. Here’s Michael sipping hot tea like a true Englishman. Leeland napping during school. You can see we still had our ocean theme from the Summer. It went well with our seaport study.